Many African journalists reacted with relief Thursday at the killing of deposed Libyan leader Muammar Qaddafi, according to early reports. Some were focusing on the plight of black and dark-skinned Libyans who had been harassed and tortured by the victorious rebels because they had been or were assumed to be Gaddafi supporters. The international press freedom group Reporters Without Borders called it a good day, but a cautious one, for journalists. "Col. Gaddafi was one of the leading holders of the 'Predator of Press Freedom' title that Reporters Without Borders began bestowing after its creation in 1985," it said. "We pay tribute to the victims of his oppressive regime, to the journalists he imprisoned and to the five journalists killed in Libya since March 2011. The death of a dictator should not mean that investigations are abandoned and that impunity is perpetuated. We hope that this turning point in Libya's political history will also mark the beginning of renewal in its media." In Kenya, the Nation newspaper was among those relating Qaddafi's demise to the status of other autocratic "big men" on the continent. 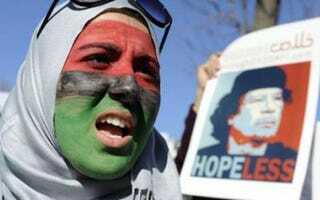 "The killing of ousted Libyan Muammar Gaddafi should mark the end of the last pockets of resistance to the people's revolt that toppled the 42-year old regime," it editorialized. "Now the National Transitional Council must consolidate its position, restore law and order, and the semblance of an effective administration across the entire country that has suffered the ravages of the bloody revolt for much of this year. "But the new leadership must realise that wiping out the Gaddafi regime must not merely be about replacing one dictatorship with another. "The Libyan people revolted because they were tired of a megalomaniac one-man rule. They have aspirations to rule of law, democracy and respect for human rights, as do other peoples across the region, who have voted on the streets against autocracy and totalitarianism." Some Western "progressives" viewed U.S. and European support for the rebels as evidence of neo-colonialism. Sylvester Awenlimobor, writing Tuesday for Nigeria's Sun News online, echoed this thinking. "I regard as unfortunate all that has occurred in the North African state of Libya, and I declare illegal the present occupation of the once-free nation by rebel war lords backed by insidious neo-colonialist western forces," he wrote. "I do not in any way support the tyrannical manner with which [Muammar] Gaddafi ruled his people; neither will I support the hideous attempt by the imperialist West to impinge on the Sovereignty of a State." But Awenlimobor's view was in the minority in an Africa News continent-wide roundup of opinion by journalists and users of social media.
" 'Brian Mwale, Head of Business News at Zambia's Muvi Television said from Brussels, 'I think it has sent signals to leaders like [Robert] Mugabe [Zimbabwe] who want to cling on to power for life. It has shown that Africans will stop at nothing in bringing change in the political landscape, Zambians just showed that in the recent presidential elections were people started demonstrating and were ready to pay with their blood had results come out otherwise," the roundup reported.
" 'You may also add that 20 African and East Europe journalists gathered in Brussels for … training … are happy with Gaddafi's death because the violence has claimed a lot of lives in that country and affected economic growth,' said Mwale." Other reports took note of the plight of black Libyans. "More than 1,220 Sub-Saharan Africans evacuated from the southern Libyan city of Sebhas just over two weeks ago have now safely arrived in Chad after a long and arduous journey south.
" … Anger at the treatment of Africans in Libya was still evident among the migrants.
" … 'In Libya, they took everybody with black skin and considered them as mercenaries and put thousands in prison,' yet another Chadian evacuee stated." Agence France-Presse wrote Sunday about blacks who fought in Qaddafi's army: "More than 400 armed Tuaregs have arrived in Mali … prompting regional security concerns, officials said on Sunday." Reuters noted that displaced black residents of Tawargha, Libya, will present a problem should they come back. Referring to the National Transition Council, the story said, "While the NTC favors the return of Tawargha's residents, it admits this will take time. But resolving the issue remains a test of its leadership to come. Much of the city lays in ruins and people in neighboring Misrata say tensions are still too high to allow a return that could spark more violence.
" 'In the end it's another ghost of Gaddafi — he paid many of the tribes to fight for him, so now people see black people and immediately assume they support him, even if they don't," said Imad Eddin, an anesthesiologist volunteering at the camp."